Vonzeles (Von – Zel – us) is a team of talented artists whose passion for music commands people’s attention and lures them to listen attentively. Creating music about the fun and enjoyable aspects of life is just the beginning of the musical and social movement Vonzeles represents. The spirituality and consciousness of the band is clearly felt in their music and forms the basis for their energy and enjoyment of the physical world we create and live in. Vonzeles’ hard work, perseverance, energy and presentation of live shows cement all listeners with the soul of Vonzeles. 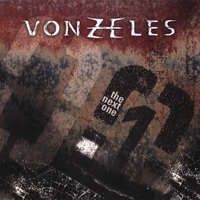 With their new CD called “The Next One,” the hard-rocking quartet Vonzeles is making musical waves with their unique melding of precision power rock that is making the music industry stand up and take notice. But Vonzeles brings down the house with cuts like “I Remember,” an affectionate ballad with Zeppelin-like acoustic guitar that explodes lyrically and musically (ala 3 Doors Down) into a song that people can relate to. The instrumental "This One," with more inspiring acoustics, appropriately serves as an introduction and compliment to "This Is Me," with rough-edged confessional lyrics and rapid-fire, high voltage guitar work adroitly reflecting the song's rage and bitterness. “Useless Woman,” with its bold lyrics, is another heavy rocker with a fantastic lead guitar that meshes perfectly with the spitefully sung husky growl of Carl, the lead singer. Other cuts like “Cocked & Loaded,” full of fuzz guitar, heavy bass lines has the listener thinking Metallica is playing along with the band. The cuts “End Of Days,” “Half Of It” and “Next One” are all full of grungy guitar rock and all would be right at home on any heavy metal radio station play list. All in all, “The Next One” is by far Vonzeles breakthrough CD, full of slashing riffs, explosive vocals and straight-up rock and roll. One can actually feel the music, something that every band or artist strives to achieve. Vonzeles has captured this element perfectly and does not let their listeners down. "The Next One" Reviewed by RadioIndy.com! Get ready to hit the highway. "The Next One" by Vonzeles is eleven tracks of pure adrenaline. The band is tight with a great relationship of gritty guitars, a hard driving rhythm section, and commanding vocals. There are no tricks in the bag with this CD. It is straight up rock by a very talented band. The band uses tight breaks and harmonies effectively on a number of tracks. "Cocked and Loaded" and "Feel Good" really hit the mark with great riffs and a flow that leaves you wanting more. "I Remember" is a powerful stadium ballad with soulful lyrics - a definite sing-along. This CD puts you on stage with the band and gets right down to the business of rock.